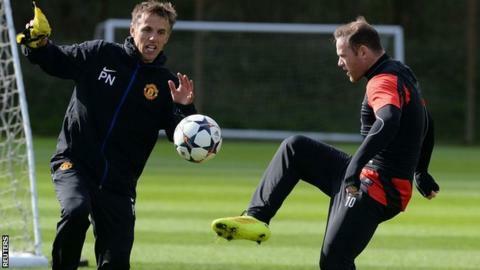 Manchester United manager David Moyes says he would be "mad" not to let Wayne Rooney play in Wednesday's Champions League quarter-final second leg against Bayern Munich. There were concerns over the striker's fitness after he picked up a toe injury in the first leg, which ended 1-1. The 28-year-old trained on Tuesday and could play with an injection. "He is happy to take an injection, which shows his feeling about the game and the club," said Moyes. He added: "He is massively keen to be involved. He has not trained all week so we will have to be wary of that, but we will do everything we possibly can. We need him as well because he is a really important player to the team. "We think it is OK because we wouldn't do anything medically wrong. We take advice from the doctors but everyone knows the character Wayne is. He is determined to play, if he is determined we would be mad not to let him do so." Rooney's injury kept him out of Saturday's win at Newcastle but Bayern boss Pep Guardiola expects the England international to feature. "He will play, I am 100% sure and I am willing to bet a large glass of beer on it," said Guardiola. "This is one of the best players I've seen and the big players do not want to miss this type of game." Moyes's men held the defending champions to a 1-1 draw at Old Trafford, after Bastian Schweinsteiger cancelled out Nemanja Vidic's header. But the United boss admitted his side would have to be even better to progress to the semi-finals. The former Everton manager said: "We will need a very good performance from everyone. It is a game all the players are looking forward to. I feel the players are going into the game in a good frame of mind. It is like a cup final for us." Holders Bayern struggled to break down the home defence in the first leg and Guardiola is again expecting United to try to frustrate the German champions. "I think United will be again waiting for us at the back," said the Spaniard. "They will be waiting deep, deep in their own half. "English teams defend and then wait for the quick break. David Moyes also has eight, nine players at the back. They are waiting for mistakes, set-pieces and breaks." Bayern have already won the German title but their record 53-game unbeaten run in the Bundesliga came to an end last Saturday after an under-strength side lost 1-0 at Augsburg. They have not won in three games, but Guardiola said: "I knew we would lose eventually. Obviously we still have to play the last few Bundesliga games but our targets are now different ones."